Conveniently located Approx. 2 ½ miles off of US Rte. 23 * $20,000 MINIMUM BID! 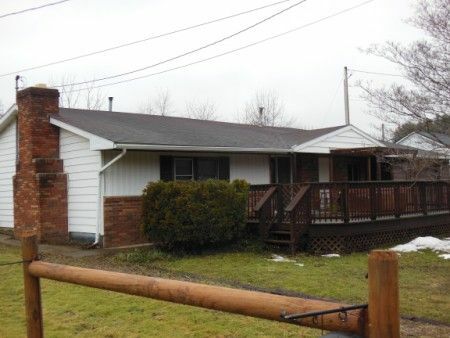 * Sold Turn-Key with Household Goods * Being a nice 5 Room, 2 Bedroom, 2 Bath Ranch Style Home with attached concrete floor one car garage situated on apx. 0.67 acres of country setting. Home consists of Living Room; Great Room with unique massive exposed brick hearth and face wood burning fireplace; Bedroom with closet and attached full bathroom with shower plus sliding door access to the rear concrete patio; Open concept Kitchen with top and bottom cabinetry; Dining Area with pantry; Bedroom with closet; Full Bathroom with shower over tub; Enclosed Back Porch/Utility Room with washer/dryer hookup. Home also offers front wooden patio with enclosed hot tub that sells with the property! 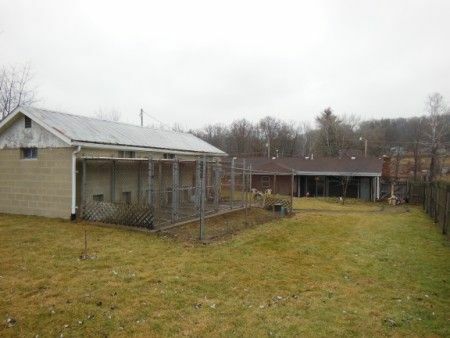 Property also has a detached concrete floor, block pet kennel previously used as a pet day care and boarding business. Kennel has 10 runs with interior/exterior access for animals, also offering electric, water, LP gas wall mount heat and telephone jack. What a great asset for your new home, whether you have pets or want to supplement your income. Real Estate Terms: Minimum Bid $20,000; $7,000 down at the time of sale cash/check, balance and possession at closing on or before April 15, 2014; ; offered free and clear prior to closing. No Buyer’s Contingencies exist; Sold in its present As-Is condition, No warranties or guarantees offered, expressed or implied. All information provided is to be utilized strictly as a guide.